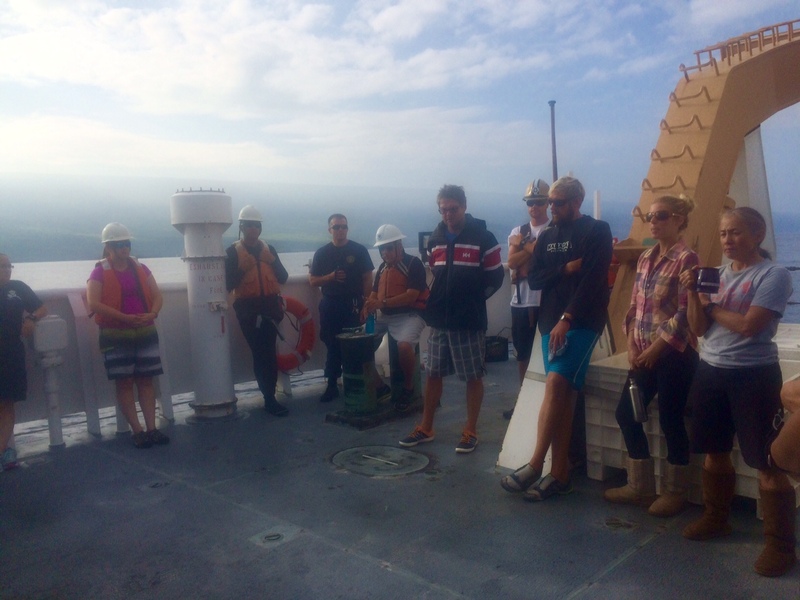 Days at sea begin early for the scientists aboard the Hi’ialakai. There are push-ups on the bow at 0630 (not mandatory), followed by breakfast at 0700. After breakfast, everyone meets outside on the deck at 0730 for a meeting about the day’s diving. Safety procedures are always reviewed during this meeting. Afterwards, the divers suit up, get their gear together, and get ready to board small boats, which will take them to the day’s scheduled diving sites. The way the small boats are lowered into the water with their passengers and gear from the larger ship is nothing less than a carefully orchestrated ballet of synchronized movement, line management, and communication. The chief boatswain (“bosun” for short), the senior crewman of the deck department, is in charge of this process. You can see him in the first photo, operating the crane. Anyone on deck during this time must wear a hardhat for safety purposes. You would not want to get hit in the head with moving cranes, hooks, or cables! First, the small boats are lifted from the upper deck with a crane and lowered over the side of the ship. The crane lifts the boat from the deck. Then it swings the boat to the side of the ship. The boat is lowered to the cutout on the deck. Then, gear and passengers are loaded onto the boat, and it is carefully lowered into the water. Lines are released. and the boat drives away. Gear and passengers are loaded aboard. Lines carefully lower the boat into the water. The lines are released and the boat drives away. After that, the coxswain, the driver of the boat, takes the divers to the first survey site of the day. As we learn in class, a very important part of any scientist’s job is to gather evidence and data. Three to four groups of divers in separate small boats will gather data from 5-7 different sites each per day. After this project is complete, scientists will have gathered data from hundreds of different sites around the main Hawaiian islands. At each site, they do fish counts and benthic (sea floor) analysis. They estimate the amount of coral present on the sea floor, and then list fish by their species and quantity. Each diver takes a clipboard with a waterproof piece of paper attached to it on which they record their data. They also carry waterproof cameras with them, as well as a small extra tank of oxygen called a RAS (Redundant Air System) that they can use in case their tank runs out of air. Diver Jonatha Giddens enters the water. Diver Raymond Boland using a stereo camera to measure fish. Photo courtesty of NOAA Fisheries. Taken by Andrew Gray. After data is recorded for several different sites, the small boats return to the ship no later 1700, which makes for a very long day out on the water. Dinner is from 1700-1800, and afterwards, scientist divers head to the dry lab, where all the computer equipment is located, to enter the data they gathered on fish during their surveys. While we were out at diving sites today, I had the opportunity to interview Jonatha Giddens, one of the divers on the boat. Jonatha is a graduate student at the University of Hawaii at Manoa. 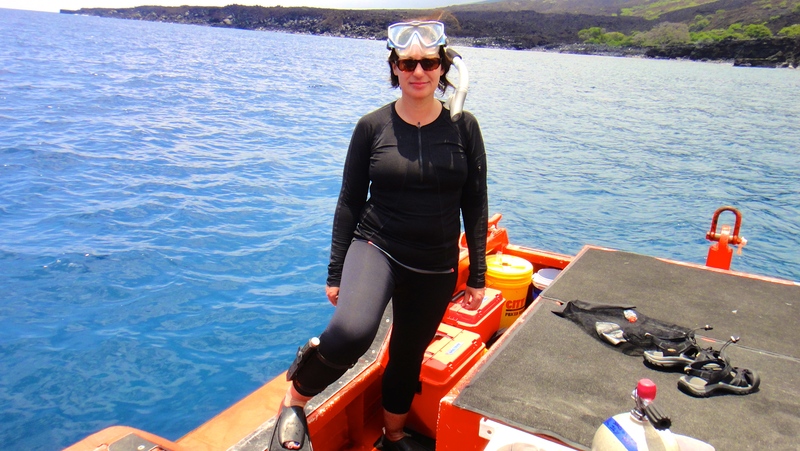 She has an undergraduate degree in coral reef fish ecology, and she is currently studying the effects of an introduced grouper (a species of fish that is not native to Hawaii) on the local marine ecosystem for her Ph.D.
What are your primary responsibilities? Being part of the fish team, scuba diving, doing fish surveys, and entering the data collected during the day into computer systems at night. What do you love most about your job? Being on the water! Do you have any advice for young people interested in your line of work? Get involved with research as early as possible. Find out what kind of research is going on in your area, and volunteer. Do summer internships at places that are farther away. You learn so much just by jumping into it. Jonatha followed her passion and learned all she could about it. Now she has won an award from ARCS (Achievement Rewards for College Scientists) for her work in conservation ecology. ARCS is a foundation organized and run entirely by women to encourage female leadership in STEM careers. Go Jonatha! Don’t mess with this snorkeler! I can sometimes go snorkeling while the divers are completing surveys, as long as I stay far enough away from them that I do not interfere with their work (they do no want me to scare the fish away). I have to wear a knife strapped to my leg while snorkeling, in case I become tangled in fishing net or line (or in case there is a shark!). Again, it is all about safety on the Hi’ialakai. The underwater apparatus held by Raymond Boland in the above photo is a stereo camera. It is composed of two separate cameras encased in waterproof housing. When a diver uses it to photograph a fish, two simultaneous pictures are taken of the fish. 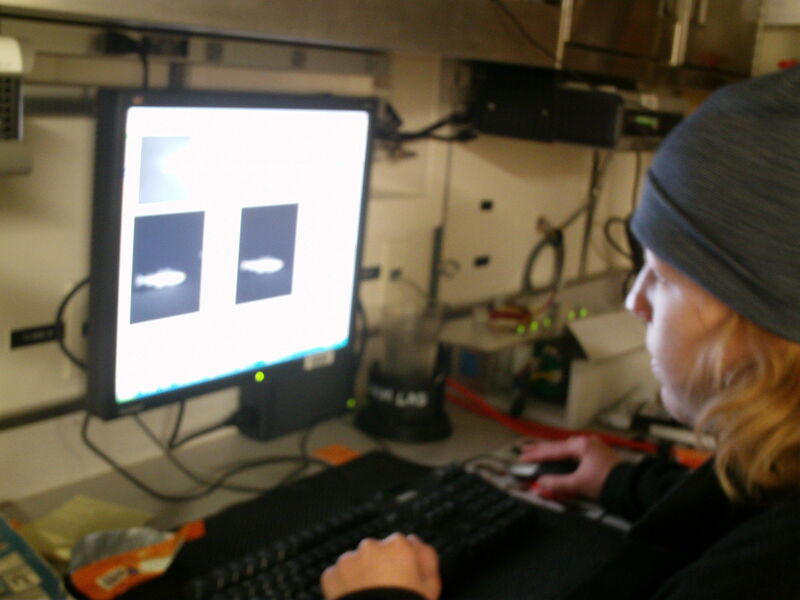 NOAA scientists calibrate the images using computers to get an accurate measure of the length of fish. coxswain – a person who steers a ship’s boat and is usually in charge of its crew. 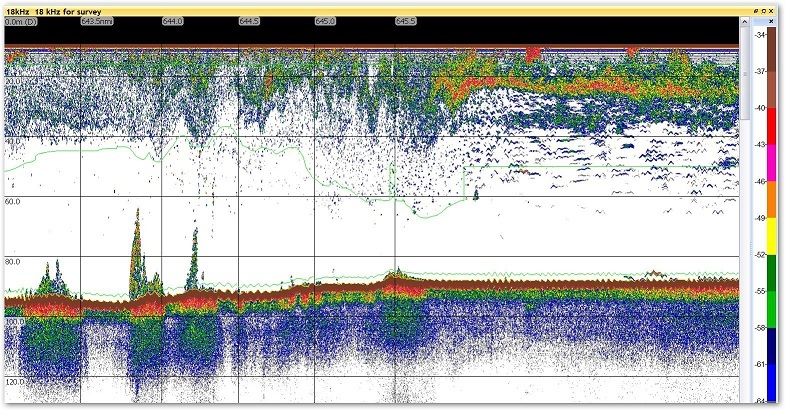 The sonar on the Oscar Dyson recently created the graph below. The graph displays the sea floor, the red, yellow, and green bands toward the bottom and along the top a few meters from the surface the layer of green and red, is the mystery. The echoes, that create the graph do not look like fish. The scientists recognize that something is there, the questions is, what? Further exploration is done, but nothing definitive is found. This creates a bit of a dilemma, which initiates a whole series of conversations about trouble shooting the equipment, using different data gathering techniques (something different than a trawl), and hypothesizing about what is creating the image since there are no apparent biology. Could the image be created by something physical in the water? Until the make-up of the image can be identified the sonar signature, is titled and recorded as Mystery Mix One. Taina Honkalehto, one of the scientists on this cruise, tells me that they have been encountering Mystery Mix One for a number of years here, in the Gulf of Alaska, and in different parts of the ocean at different times of the year. Mystery Mixes Two and Three are floating around as well. The stereo camera, which I talked about in my last blog, is a new piece of equipment that scientists are using to collect data about the ocean floor and the biology of the region. The stereo camera was launched and submerged to a depth of 50m into the middle of Mystery Mix One, and left at that depth for 30 minutes while the Oscar Dyson drifted with the mix. 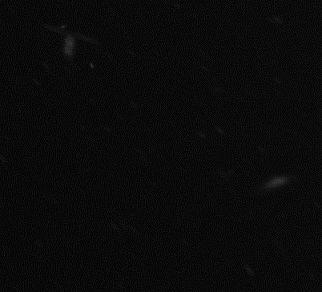 When the pictures were downloaded, the only identifiable objects were copepods, big copepods. Remember “big” is a relative term, big compared to what? Copepods can be smaller than 1 mm in length. These big copepods are probably 6 to 8 mm. This is a clearer picture of a copepod. The strong sonar image created by the copepods heighten the mystery; starting another round of questions and discussions by the scientists. Why are copepods creating such a strong sonar signature? Why are the copepods so prominent on 18 kHz? (18 kHz is a low frequency that usually captures echoes from large objects, while small things like copepods would be seen at higher frequencies, like 200 kHz.) Could something else be in Mystery Mix One, something that was not seen by the camera? The discussion goes on creating a working hypothesis; the signature is being created by a combination of the copepods themselves, whatever they are feeding on and gases, being produced. Not all the scientists are in agreement. If Mystery Mix One was to be sampled again, would you get similar results? The next day another piece of possible evidence is added. Oscar Dyson’s sea water intake filter is cleaned and what is found? Krill and big copepods. Pictures are taken and the evidence is recorded in the scientists’ journal. More evidence needs to be collected, but advances are being made to identify Mystery Mix One. Krill are in the red ringed filter. 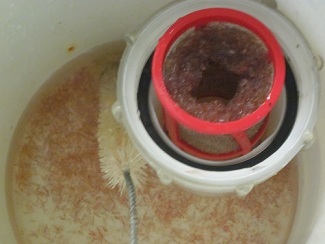 Copepods can be seen at the bottom of the bucket. The first few days out at sea the waters were really calm, 1 to 3 foot swells or seas, which feels like the soothing glide of a rocking chair. Now however, weather is moving in; wind speed is up around 15kts and the swells are about 9 ft. Friday’s forecast is for 30kt winds and 12ft. seas. Looking at the big picture, 9 to 12 foot seas are not very big. But, walking around the ship with seas of that height requires due diligent to safely navigate the passage ways and steep stairs. And you definitely need to mind the doors, make sure the door is securely latched and when opening hold on tight, as you don’t want the door to get away from you. Somebody might be standing on the other side. Another activity that can prove challenging is getting into and out of your bunk. Now imagine yourself lying on a teeter totter. You are right above the fulcrum, so you are nice and level. An unbalanced force is now affecting your teeter totter, your feet go up your head goes down and you slide a little. Then there is a change and you head goes up your feet go down and you slide back. This back and forth motion is continuous, and the motion presses you into the teeter totter. I call this the sloshing phenomena, because all the while you are teeter tottering you hear the sea water rushing pass the hull. But wait, there is more. Your teeter totter only moves in two dimensions, but we live in three dimensions. Keep your teeter totter going, up and down, hear the water stream by and add a sideways roll, back and forth. Don’t fall off your teeter totter. You are not quite ready to surf your berth yet, sometimes the up and down, and side to side movements occur so quickly that you actually loose contact with your teeter totter. Now you’re surfing! I have yet to find the seat belt for my bunk. 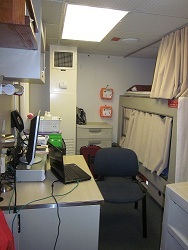 Remember I said that my berth was low in the ship, there are only a few berths on this level, and more berths are two and three floors above me. Now think about a metronome. If you’re not sure what a metronome is think about a windshield wiper on a car. Both the metronome and the windshield wiper make small movements at the pivot point or fulcrum; the further away from the fulcrum the greater the range of motion. Think about how the motion is magnified as you move up from the water line. Those folks above me are really surfing. When Taina and I were talking about Mystery Mix One she said the 18 kHz frequency ensonifying the larger fish. I think ensonify is a cool word. I wonder if Mrs. Sunmark or Mrs. Delpez (our school’s band and orchestra teachers) have used the word ensonify in their classes? Can any of you tell me what ensonify means? Did you know you can follow my voyage on NOAA’s ship tracker website? Here is the link. In my next blog, I have another fashion statement – Gumbi Marla! And maybe something about the moon and Apollo 17. 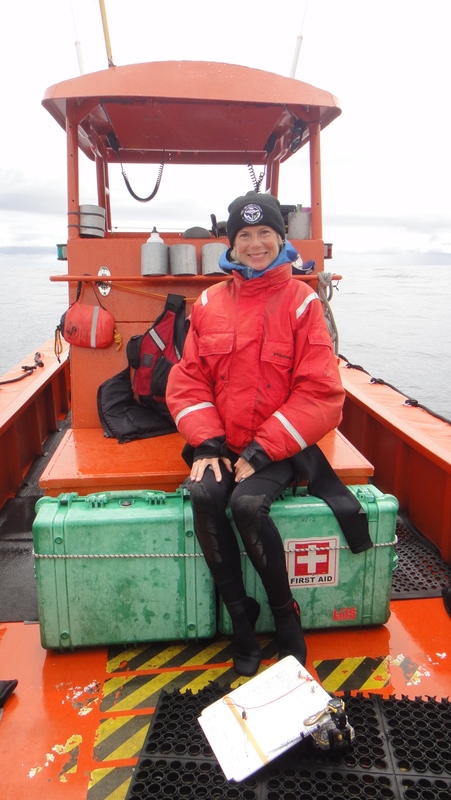 Here I am all decked out in my rain gear in the wet lab, ready to sort the catch of our first bottom trawl. Quite a fashion statement, don’t you think? Me in my slime gear. Walleye Pollock (latin name Theragra chalcogramma), a fish that lives both on and above the seafloor, is the main target of the Pollock survey, but information about other sea life is also collected. When we start sorting the catch from this bottom trawl, the primary population is Pacific Ocean Perch (POP, Sebastes alutus). The POP is a member of the Scorpaenidae or scorpionfish family and has poisonous spines. When handling the fish I have to be really careful of the very sharp spines to avoid injury. Fortunately, the POP’s teeth are not as formidable as their spines, so I can grab them by the mouth to safely move them around. After we sort the catch the total weight of each species is recorded. We collect additional biological data on the POP, by first sorting them by “Blokes” or “Sheilas.” I’ll let you figure out what characterizes Blokes and Sheilas. After the sorting, each fish in the sample is laid on an electronic measuring board (mm) to determine and record the length of the fish. In this survey the length of the fish is measured from the tip of the mouth to the center of the “v” in the tail, this is know as the fork length. Other populations being sampled are plankton and the jellyfish that were collected in a Methot trawl. Here Abigail McCarthy is sorting two types of zooplankton krill (also called euphausiids) and jellyfish that were collected. 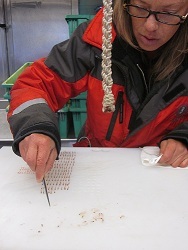 Once the sorting is completed, then the quantity and weight of the krill and the jellyfish is recorded. One of the areas Abby is investigating is if there is a correlation between the krill population and the location of baleen feeding whales. Abby wonders how far away the whales can smell or sense dinner? Who can tell me which species of whales are baleen feeders? Another tool the scientists use to collect data is a tethered stereo camera that takes 10 pictures/second. Using the pictures I am counting and sorting fish by species. 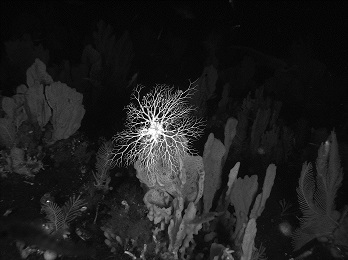 Look at the pictures and you’ll see a Gorgonia sea fan and a basket star. The camera has a stationary photo length, so objects closer to the camera appear bigger. In the picture with the sea fan, you are also seeing krill. You can use the pairs of images from the stereo cameras to measure the size of the organisms that appear in the images. 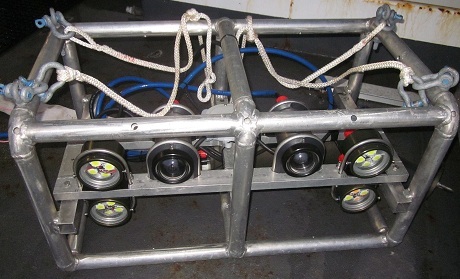 The two cylinders in the center are the cameras and the four other cylinders are strobe lights. The sea fan is a member of the soft coral family. Krill can be seen in front of the sea fan. Picture provided by NOAA. When the Oscar Dyson sailed from Dutch Harbor we head west to the Islands of Four Mountains, a cluster of volcanic isles. On one isles is Mt. Cleveland, which on May 5th was actively spewing lava. As we pass, Mt. Cleveland is quietly shrouded in dense cloud cover. Darn, cannot check eruption off my “Want to see” list. I don’t think I’ll see an aurora either as the cloud cover has been thick. This is the south side of Unalaska. Dutch Harbor is on north side facing the Bering Sea. Science aboard the Oscar Dyson runs 24/7. Both the Dyson’s crew and the science team work in twelve hour shifts. For the Dyson’s crew the day is broken into two shifts, from midnight to noon and noon to midnight. The science team shifts are from 4 a.m. (0400 hrs.) to 4 p.m. (1600 hrs.) and 1600 hrs. to 0400 hrs. I am on the 1600hrs to 0400hrs shift; morning and night run all together. A note here, when the scientists collect data the time stamp is Greenwich Mean Time (GMT). GMT is eight hours ahead of us here in Alaska. My last blog I said that I would talk more about the cam-trawl. This technology was created by scientists working on the pollock survey. 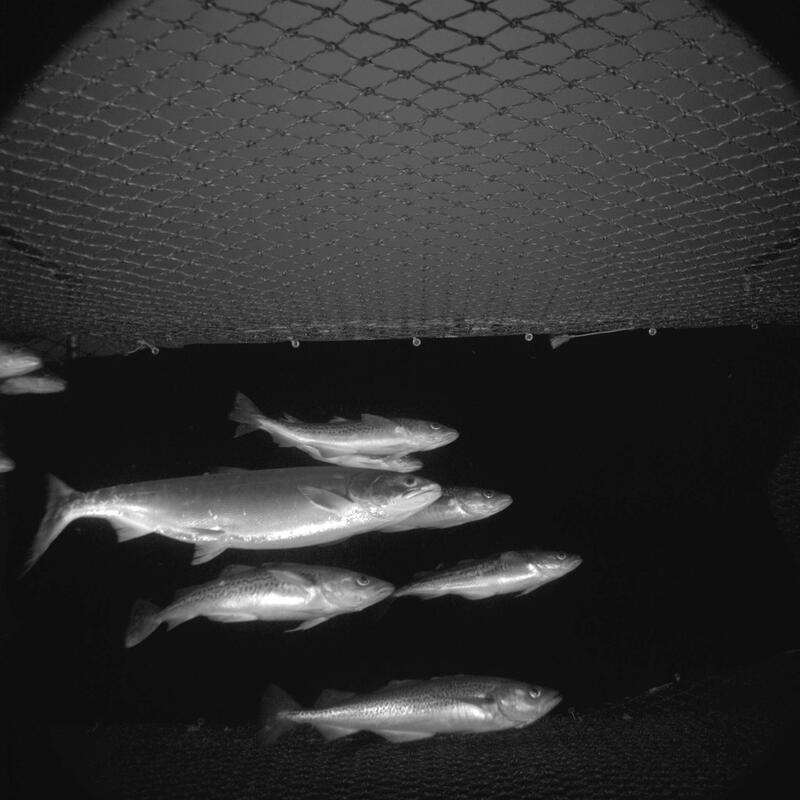 The purpose behind the cam-trawl is to be able to put a net in the water with an open cod-end (basically a net with an opening at the end), and have images of the number, species, and size of fish that went through the net. Of course, sometimes some fish would have to be brought on deck so the otoliths and stomachs could be taken back to the lab in Seattle. Overall, this could eliminate taking so many research-based fish and/or invertebrate samples. 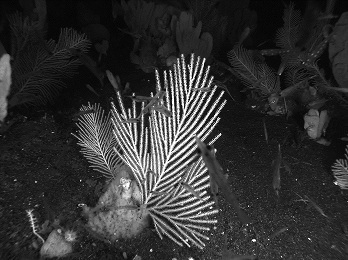 When cam-trawl is used on acoustic-trawl surveys, the echograms can be matched up with the stereo-camera images which can provide more data about the distribution of fish or other marine organisms in the water. How the cam-trawl works: it is a stereo-camera system that takes snapshots of whatever comes through the net. These images allow the research team (including me on this leg) to determine the approximate number, species (some, not all), and size of fish that go through the net. The pictures are taken at the same time, but because of the slight difference in camera position, they look similar but not identical. You can mimic this with your eyes by looking at an object with only your right eye, then switching to looking with only your left eye. Did you see the same object but from a slightly different perspective? This is called disparity, or parallax (astronomers often use parallax to estimate the distance of far-away stars or other celestial objects). The program that was written for the cam-trawl (also by this research team) can then calculate the approximate size of the fish based on their relative positions. In this photo, I’m using the cam-trawl measuring program to measure a sample of fish. This screen shot shows the stereo-images and the yellow measurements that I’ve added. 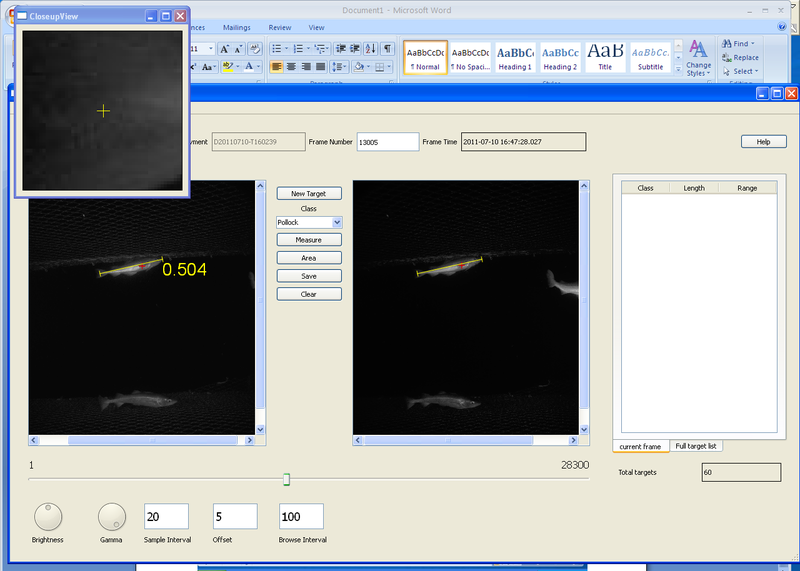 Using the lengths that I’ve chosen for the program, it calculates the approximate length (in meters) of the fish. After several windy days with lots of swell, I’m happy to be in calmer waters. I’ve been working on the computer for some of the time which doesn’t go well with swell. I have also found it to be very tiring and tense on my body to be in constant motion and prepared to grab whatever I can to stay upright. I can’t tell you how hard it is to use a treadmill or take a shower in rough seas! BUT, for the time being, it’s calm and I just watched a great sunset over Kodiak island with a few humpback whale blows in the distance. If you are still wondering about the salmon in the picture above, it’s a chum!